Mauremys leprosa saharica. Ouarzazate. Photo: © Mario Schweiger. Mario Schweiger (2012): Mauremys leprosa (Schweigger, 1812). Au: Martínez, G., León, R., Jiménez-Robles, O., González De la Vega, J. P., Gabari, V., Rebollo, B., Sánchez-Tójar, A., Fernández-Cardenete, J. R., Gállego, J. (Eds.). Moroccoherps. Amphibiens et reptiles du Maroc et au Sahara occidental. Disponible à www.moroccoherps.com/fr/ficha/Mauremys_leprosa/. Version 23/09/2012. Consulté le 25 Apr 2019. Aire de répartition de Mauremys leprosa. Mauremys leprosa was described by Schweigger in 1812 as Emys leprosa. Synonyms are Clemmys sigriz Michahelles, 1829 (Terra typical [T.t.] South Spain) and Emys laticeps Gray, 1831 (T.t. : “south Europe”). Out of Europe Gray in 1854 described Emys laticeps from the Gambia River. In 1860 followed Emys fuliginosus and in 1870 Emys fraseri by the same author, both with imprecise Terra typical “North Afrika”. 1996 Schleich, from Morocco described 6 subspecies: atlantica (Larache), erhardi (Taza), wernerkaestlei (Khenifra), marokkensis (Tahanaoute), saharica (Fort Bou Jerif, Guelmim) and zizi (Oued Ziz). 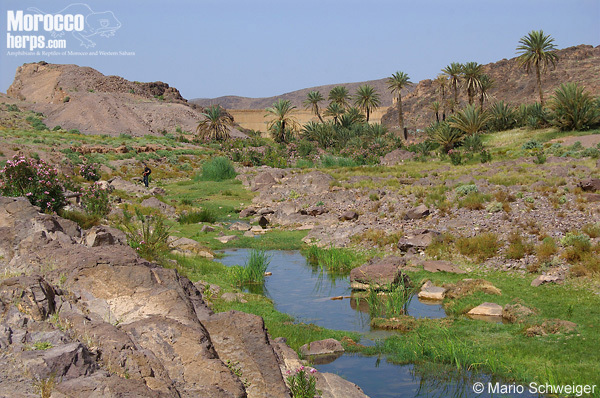 1998 the last subspecies, Mauremys l. vanmeerhaeghei from Sidi el Mehadahoui has been described by Bour & Maran. (Authors note): I´m not sure, if Emys fraseri Gray, 1870 is a synonym of Mauremys leprosa, because Gray 1870 writes: “……In the British Museum there is a specimen of a young Terrapin brought by Mr. Fraser from North Africa, which is very similar to the above, and has the same black underside of the margin; but its neck has many much narrower streaks, and there is no spot behind the eye or rings round the ear. This specimen appears to indicate the existence of another species, which may be called Emys fraseri.” All young specimens of Mauremys leprosa in North Africa have this light spot behind the eye and many of them this ring around the tympanum. 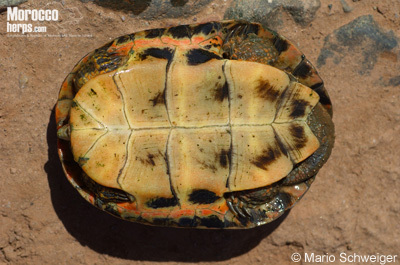 A freshwater turtle with distinct yellow to orange stripes on neck and limbs. Carapace olive to brown, mostly with orange ocelli or hieroglyphs. All markings fade with age, on skin and shell. Dorsal view. Ait Ourir. Photo: © Mario Schweiger. Females grow larger than males, especially south of the Atlas mountain chain. Lovich et al. 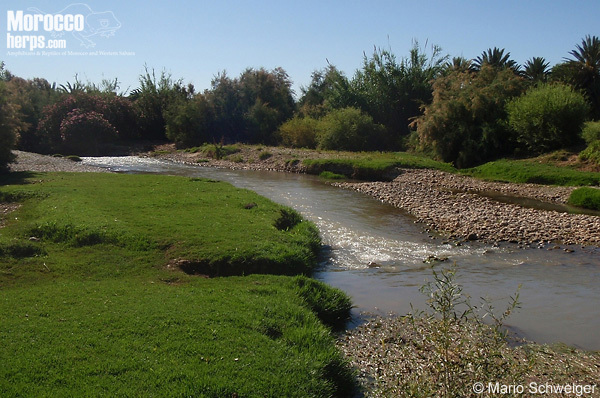 (2010) give a maximum of 151mm for females and 129mm for males from the Oued Ksob. 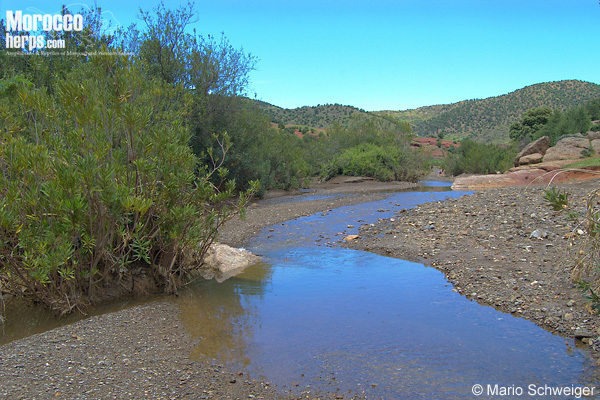 For turtles from the Oued Zate the values are 166mm and 122mm and for the Draa river 216mm and 115mm respectively. The Plastron is uniform yellowish to olive green, with or without smaller to larger black patches, to uniform black. Plastron. Right: Ait Ourir. Left: Khenifra. Photos: © Mario Schweiger. 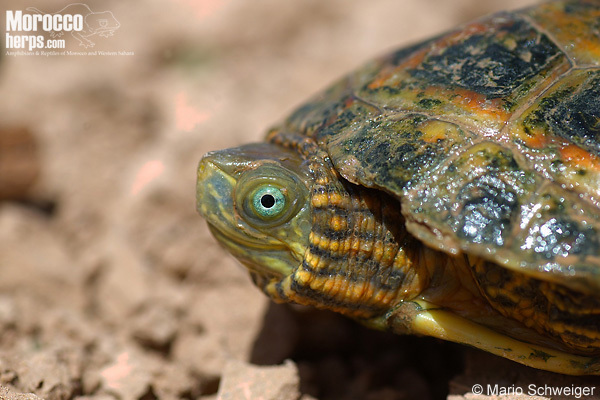 Most terrapins from the north have a distinct dark horizontal bar through the green iris, while this bar is missing in most specimens south of the Atlas mountain chain. Also many turtles have bluish to blue eyes in the south. Mauremys leprosa saharica with blue eyes. Ouarzazate. Photo: © Mario Schweiger. These differences induced Schleich 1996 and Bour & Maran 1998 to describe a total of seven subspecies from Morocco. As shown by Fritz et al. 2005 and 2006 these taxonomic splitting was not correct. 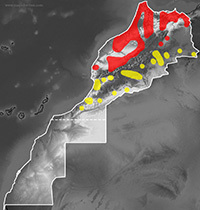 At the time only the nominate form in NW Morocco and SW Europe and Mauremys leprosa saharica, south and east of the Atlas mountain chains are valid. Additional, in 2011 Schweiger showed, that there is no correlation between the morphological characters, given by Schleich for his subspecies and their geographical distribution. Therefore, the subspecies, atlantica, wernerkaestlei and marokkensis are included into the nominate form now, the subspecies vanmeerhaeghei and zizi into Mauremys leprosa saharica. At the time it is not clear, into which of the two subspecies now accepted, Mauremys l. erhardi has be included. The Terra typica near Taza is situated east of the Moyen Atlas. According to the distribution of Mauremys l. saharica by Fritz et al. (2006), erhardi should belong to this subspecies. 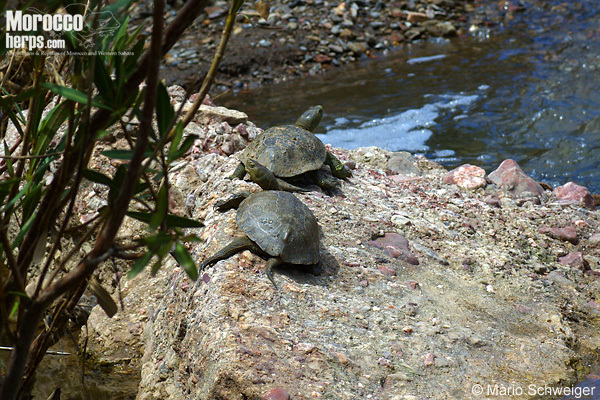 Beside Emys orbicularis occidentalis, Mauremys leprosa is the only freshwater turtle in Morocco. 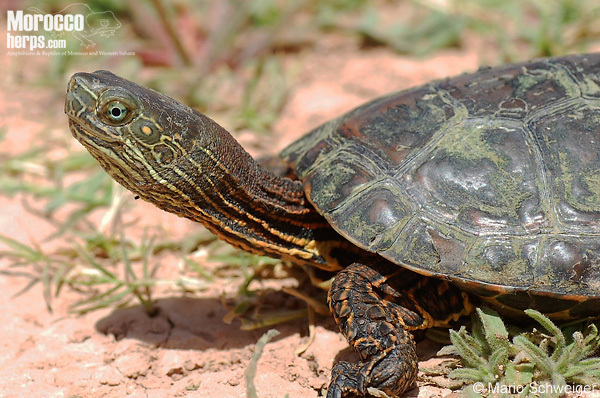 While the former is restricted to small populations in the NW of Morocco and the surroundings of Azrou, the Spanish Terrapin is widespread all over the country. Both species can easily be distinguished by their different coloration and pattern. 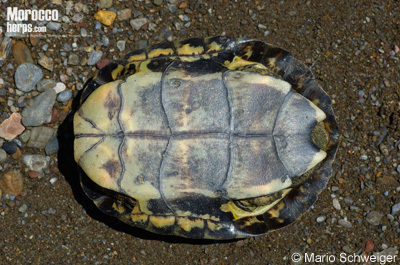 Emys show a black carapace with small yellow dots and/or lines. Also the head, neck and limbs have yellow spots and never distinct lines. Mauremys leprosa is diurnal as well as nocturnal. During sunny days, the turtles spend many hours basking on banks or rocks in rivers, creeks or ditches, sliding into the water at the slightest disturbance. It is hard to observe them from a distance more close than 20 metres. During dark, the turtles might be observed with a flashlight, walking around on the bottom of the waterbodies, searching for food, or resting at the edge of the water close to the surface. Two Mauremys leprosa leprosa basking on a rock. Khenifra. Photo: © Mario Schweiger. Egg holes are digged from late afternoon to evening. Females need 30 minutes to one and a half hour to dig the hole, up to 60 mm deep and 100 mm wide. In warmer climates, Mauremys deposits two clutches during May and July, consisting of up to nine eggs in Morocco, while clutches of 13 eggs are known from Portugal. Eggs are 28 – 38 x 16 – 21 mm in size. The incubation period lasts 56 – 108 days, depending on temperature (Keller & Busack, 2001). 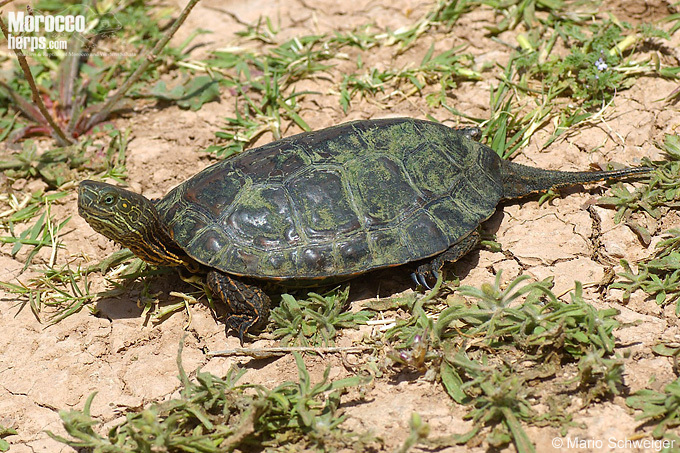 If available, hatchlings and youngs prefer smaller waterbodies than adults. This might be linked with warmer temperatures, more adequate food in small waterbodies, but also protection from the always hungry adults. Young and subadults feed mostly on invertebrates, while in adults the food changes more to vegetarian (water plants and algae). From SW France, Spain, Portugal to NW Africa (Morocco, Algeria, Tunisia, W Libya, not known from Western Sahara, some relict population in S Mauretania and in the Aïr mountains in Niger (Kriska, 2001) and in Gambia (?). Habitat of Mauremys leprosa saharica. Ouarzazate. Photo: © Mario Schweiger. 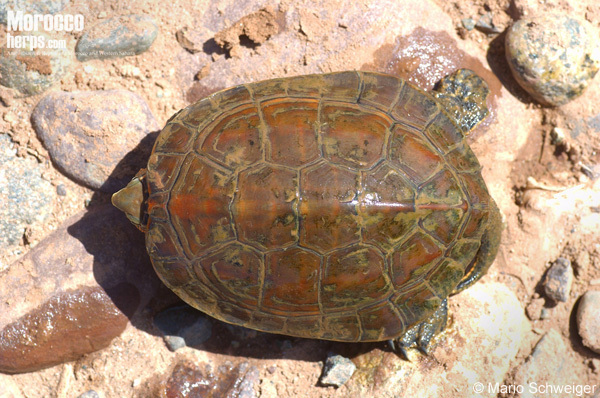 The Spanish Terrapin is widespread in Morocco. A large variety of waterbodies are populated, like rivers, creeks, lakes and ditches. Turtles might be found even in brackish and eutrophe waters. Mauremys leprosa leprosa is distributed north and west of the Atlas mountain chains, Mauremys l. saharica south and east of the mountains. Habitat of Mauremys leprosa saharica. Meski. Photo: © Mario Schweiger. Due to missing data from north east Morocco, the affilation of the specimens from there to one of the subspecies leprosa or saharica is not clear yet. But there are some examples, where the Moulouya river is the border between (sub)species like Timon tangitanus/pater or Psammodromus microdactylus/blanci. The Moulouya valley is the old connection between the Mediterranean and the Atlantic Ocean, before the Strait of Gibraltar was opening. So this valley should have been a strong barrier between (sub)species. Habitat of Mauremys leprosa leprosa. Khenifra. Photo: © Mario Schweiger. In all populations, known by the author, the abundance is high, with most specimens observed in the night hours. In subsaharian areas, they populate even small waters in oasis, far away from the next creeks or rivers. Adults seem to have little to no predators, while hatchlings might be preyed by adults, birds of prey and rodents. Hard to catch in large waterbodies, but more easy during dark, when the terrapins are walking around on the bottom or at the edge of the water.